Everyone loves a good 'ol wedding story, but some of these ones show that love during this special time is not just between the two people getting married. 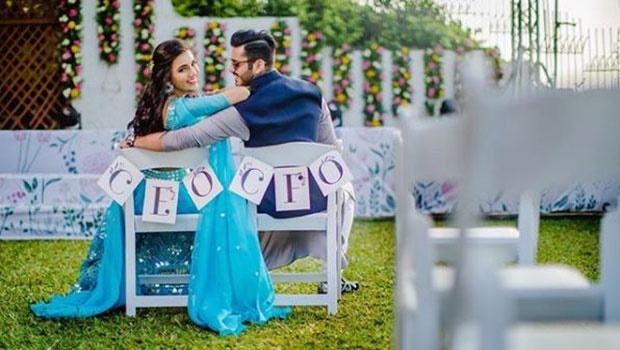 After dating for three years, 24-year-old blogger, Masoom Minawala and her then 26-year-old boyfriend, Shailin Mehta tied the knot in an elaborately festive wedding held in India. From the holi ceremony to live streaming the wedding, Masoom didn't hold back and ensured her followers were 100% virtually part of her special day. Her Instagram feed has more than 70 stunning photos linked to her wedding weekend. And it was PERFECT. Miller's aim was to find a unique and empowering way to celebrate the eight ladies that made up her bridal party before her wedding, so she held a professional swimsuit photoshoot with her ladies in the Bahamas and she stunned in a white one-piece design by Glen Riley and Rudolph Brown, reports TheKnot.com. Also perfect? Her exquisite wedding gown! When it came time for the bouquet toss, Jess Nakrayko put a spin on the tradition and handed it to her best friend, Jessica Kieley. It sparked a few seconds of confusion until Kieley turned around to see her longtime boyfriend Adam Brake kneeling behind her with a ring in hand to propose. Unlike this story where social media users were outraged when the best man interrupted the wedding ceremony to propose to his girlfriend, today.com notes that Nakrayko told Brake that "[he] wouldn’t be taking away [their] thunder or anything like that. We have our whole wedding and everything after that for all the attention to be on us." Kieley's completely unexpected proposal was thoughtful, memorable and sweet, and was at least held after the ceremony. Considering the circumstances, it wasn't love at first sight for Roseann Sdoia and Mike Materia, nor did it happen immediately after the tragic event. After the bombs went off, the Daily Mail says that Materia, a firefighter whom Sdoia calls her 'guardian angel', used a belt as a make-shift tourniquet for her badly injured leg and held her hand as she was rushed to hospital. According to theknot.com, Sdoia's right leg was amputated and Materia frequently visited her in hospital to support her throughout her recovery. It was from there that love blossomed. Materia proposed while the couple were vacationing in Nantucket. It was done after he put a special engraved dog tag on their dog Sal, saying 'Mike wants to know... If you'll marry him.' CUUUUTE! Bride-to-be Jordyn Cleverly wanted to secretly don the wedding gown that her grandmother wore when marrying her high-school sweetheart 55 years ago. Jordyn didn’t tell her grandmother, Penny, whose husband passed away before she was born, that she would be wearing the gown until the rehearsal dinner that night. Photographer Kortney Peterson captured the moment Penny saw her granddaughter in her gorgeous gown. A first look unlike any other I've done before....Between this sweet bride and her grandma. The bride secretly got her widowed grandma's dress from 1962, and wore it for her big day yesterday. Grandma had zero idea! Yes. You guessed it. I bawled. Jordyn surprised her sweet and tender widowed grandma, with wearing her grandma's dress from 1962 for her own wedding! Her grandma had no idea Jordyn even had the dress in her possession until she walked out revealing it to her before the wedding rehearsal. So lucky to have captured this sweet moment!